This is the second commission I am currently working on. 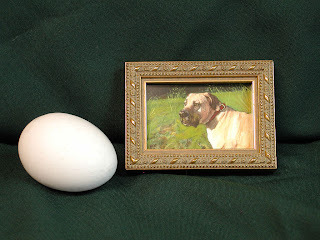 It's a copy of a painting by George Earl an artist in the late 1800's. The client once owned an original limited edition print of this painting. 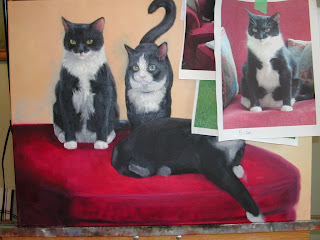 I had a small image of a copy I had previously done of this painting on my website, which led the client to me. I am a participant in the copyist program at the National Gallery of Art in Washington DC. I find the program is invaluable to my self education program. By copying the originals, I learn about color, composition and brushwork. You get to study the masterworks in the collection up close. As good as a college degree, maybe better! I seem to never just have one painting going at a given time. I am currently working on two commissions. This is one of them. I am probably 2/3rds of the way to a finished painting at this point.The first few days on this painting went beautifully. Now I am down to the last cat and he is being a bit difficult. Seems I just can't satisfy myself with the look on his face. This is quite common for me, I am such a perfectionist. So, I will turn the painting to the wall for a few days and work on something else for a bit. I find that when I return to the painting in a few days after a brief break, I spot right off what is lacking in the painting. It really helps to look at things with fresh eyes. This is an example of the sort of artwork you will see at the 1st Annual Little Washington Miniatures Painting Exhibition. 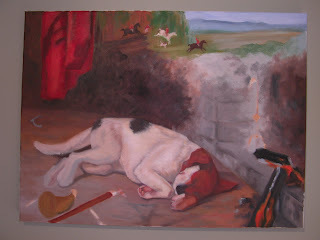 The painting is one of our Honorable Mention Winners. The painting , "Beautiful Day" is by Lena Leitzke, Shoreline, Washington and is a Watercolor. All of the award winners will appear soon on www.icehousegallery.com. There will be a reception to meet the artists and judge on October 3, from 3:00 pm until 6:00 pm. I hope you will be able to come out and help us celebrate our innaugural show that day. Yesterday's workshop had the best weather ever. 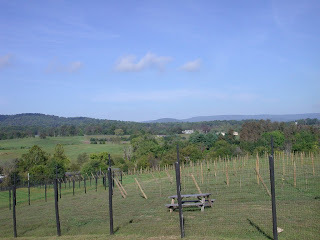 A nice breeze blew across the top of the winery deck all day. Although the temperatures got a bit warm, we were cool all through the day and we had a shady spot under the deck awning. As you can see from the photos, we were surrounded by beautiful views in every direction which made it hard for the students to choose the view they would paint. With so much to choose from, all the competeing elements made for a mind boggling decision. This presented the perfect opportunity for me to show them how to focus on one subject after filtering out all the extraneous and unnecessary stuff. After two hours of instruction and independent painting, we went inside for our complimentary wine tasting and then sat down to the gourmet lunches which I prepared the night before. We dinned on a delicious chicken salad with craisins on a bed of bibb lettuces, croisants, olives, fresh strawberries, and a festive Halloween cupcake for desert. It was hard to finish the last two hours of the day after such a nice lunch. 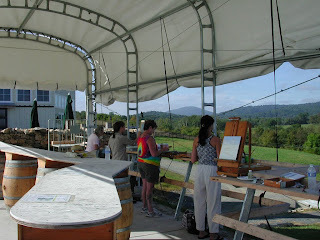 The final workshop at Barrel Oak for this year is on October 8th. Registration and payment must be received no later than Monday October 5th. Mail your registration to P O Box 365 Washington Virginia 22747. Include your phone number and e-mail so that I can confirm your registration and send you directions. You can also call 540-675-3039 to register via phone and credit cards are accepted. Another month has slipped by me and I have failed to keep current on my posts. I guess it is because I have been so consumed by the upcoming Miniatures Exhibition at the Ice House Gallery. I undertook this project, thinking I could handle it by myself for the most part. Duh!!! Just the marketing has taken most of my evenings. Then there is the nuts and bolts of the show and of course the numerous steps to receiving the art and the judging process. But I am pleased to say, its come together nicely and its going to be a fantastic show. The prize winners' images should be posted to the Ice House Gallery website next week and the reception is planned for Oct. 3, 3:00 til 6:00pm. A special treat at this reception, Barrel Oak Winery is doing a tasting for us. If you haven't had any of their wines, prepare yourself to be amazed. I can honestly say that I have not had any wine from that vineyard, that I did not just fall in love with. Barrel Oak is located on RT. 55 just a few miles from Delaplane and Marshall Virginia. Well, back to marketing and show arrangements. See you on Oct. 3rd!